a. a fluctuation, as in some business activity, voting pattern etc. a movement among English farm laborers and small farmers in southern and southeastern England in the 1830’s. It owed its origin to an increase in the number of poor and unemployed agricultural laborers brought about by the economic crisis of 1830 and by the introduction of agricultural machines. The farm laborers attacked the estates, set fire to harvested grain, and destroyed agricultural implements belonging to the landowners and wealthy farmers. The rebels’ demands were stated in letters that circulated under the signature of “Captain Swing,” a fictitious name derived from “swing,” the striking part of a wooden flail (in the figurative sense, the gallows). The movement was suppressed with the aid of troops. Variation in frequency or amplitude of an electrical quantity. The arc or curve described by the point of a pick or mandril when being used. Rotation of the superstructure of a power shovel on the vertical shaft in the mounting. To rotate a revolving shovel on its base. The action of a door’s movement, usually on hinges or pivots, about a hanging stile. ii. To turn a propeller by hand to start the engine. iii. To calibrate compass deviation by recording its values at predetermined intervals and correcting the deviation to the extent possible. iv. The sudden yaw of a multiengine airplane when one of the engines, especially the one away from the centerline, fails. 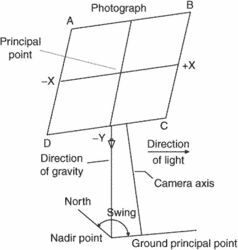 v. In aerial photography, it is the angle measured in the plane of the photograph from the positive y-axis clock-wise to the nadir point. Java's graphical user interface (GUI) package that provides a large collection of widgets (buttons, labels, lists etc.) that behave similarly on different platforms. Swing features "pluggable look & feel", allowing the program to look like a Windows, Motif or Macintosh application. It is implemented using the Model View Controller (MVC) architecture and makes extensive use of nested "containers" to control the handling of events such as keystrokes. A Java toolkit for developing graphical user interfaces (GUIs). It includes elements such as menus, toolbars and dialog boxes. Swing is written in Java and is thus platform independent, unlike the Java Abstract Window Toolkit (AWT), which provides platform-specific code. Swing also has more sophisticated interface capabilities than AWT and offers such features as tabbed panes and the ability to change images on buttons. Swing is included in the Java Foundation Classes (JFC) which are provided in the Java Developers Toolkit (JDK). See JFC and JDK. Swing calls the operating system at a lower level than AWT. Whereas AWT routines use native code, Swing was written entirely in Java and is platform independent.